Tablets (and e-readers) are marvelous inventions. And this handy-dandy stand is an excellent way to go hands-free while cooking, eating, exercising, and working in the sewing room. 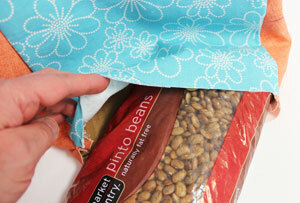 Fiberfill makes it soft and cozy, and a bag of beans weights it down. Add your favorite designs to make the stand uniquely yours. 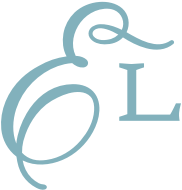 Read on for the list of supplies and project instructions! 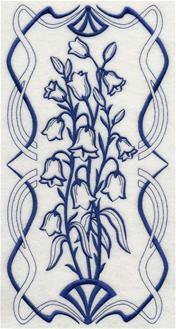 For my stand I used the small sizes of the Art Nouveau Bellflower (Bluework), the Inky Rose Trio, and the Inky Butterfly Delight. 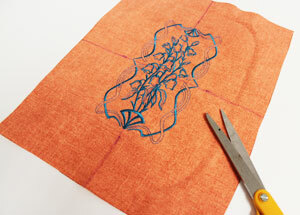 There are four areas on the tablet stand for your favorite embroidery. On the front and back panels, 5" x 7" designs fit well, and for the side panels, 4" x 4" designs are best for those smaller areas. If you think you'll use this stand in the kitchen, designs from the Food and Wine category would be tasteful. 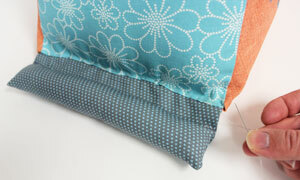 For the sewing room, there's an array of crafty designs in the Crafty and Sewing category. And if you can't wait to get into the garden, pick your favorite flower designs here. 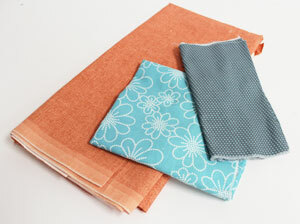 I started by preparing the fabric for the back of the stand. 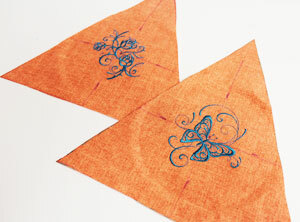 With an air-erase pen, I drew a 10" wide by 11 1/2" rectangle on the fabric (I used lightweight canvas), leaving about 2" of excess fabric around the shape for easy hooping. 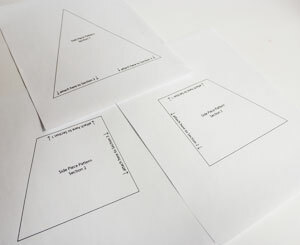 Then I printed a paper template of my design so I could place it exactly where I wanted it. 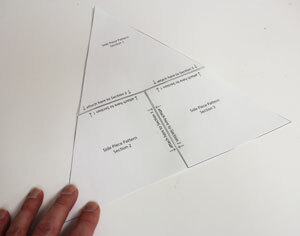 If you're new to using templates for design placement, you can find instructions right here. To center the design using the template, I measured equal distances between the center point and the outer edges of the fabric, allowing at least 2 1/2" of space between the side edges of the design and the side edges of the fabric (so I won't stitch over the design when adding accent fabric later on). I poked a hole in the center of the template to mark the center point of the fabric, and I marked the horizontal and vertical access points. Drawing lines connecting the marks helps position the fabric within the hoop. After backing my fabric with a piece of medium weight cutaway stabilizer, I hooped both, with the lines on the fabric matched up with the marks on the hoop. With the hoop attached and the design loaded, I moved the hoop so the needle is directly over the center point of the fabric and embroidered the design. Once the design was finished, I trimmed the excess stabilizer, leaving an inch or so around the design for added support. 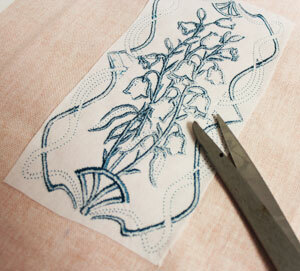 I cut out the fabric shape, and now the main piece for the back of my tablet stand was ready to go. 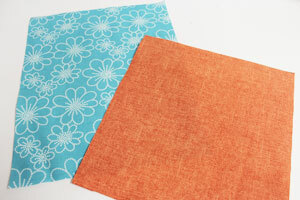 For an extra dash of color, I created accent fabric pieces to add to the back of the stand by cutting two pieces of print cotton fabric to 2 1/2" wide by 11 1/2" high. 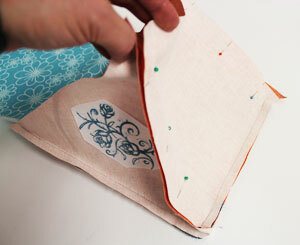 On each fabric piece, I folded one of the long edges over 1/2" to the wrong side and pressed with an iron. 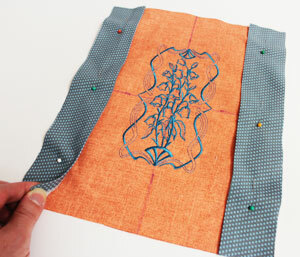 To stitch the accent fabric to the back fabric piece, I placed the accent fabric along the side edges of the embroidered back fabric, folded edges facing in. 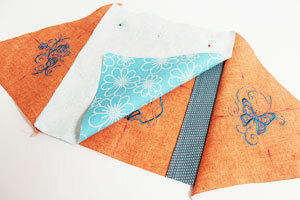 I pinned in place and sewed a 1/4" seam around the outer edges of both accent fabric pieces. 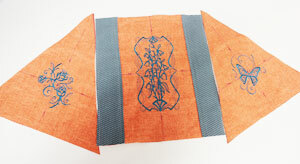 Moving on to the sides of the stand, I used a pattern to cut out these two fabric pieces. 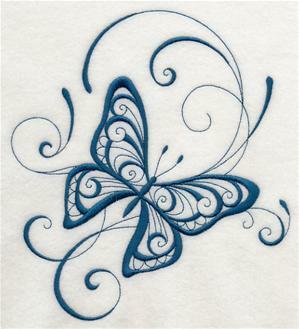 Click here to download a PDF file of the pattern; three pieces will print on 8 1/2" by 11" paper. 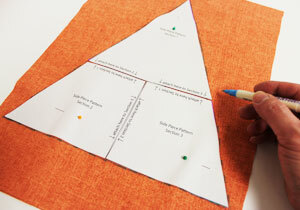 Once you have printed the pattern pieces, cut them out and tape them together, following the directions on the patterns. 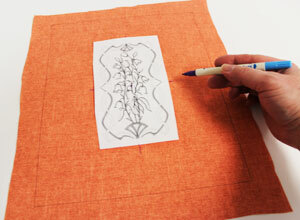 Next I pinned my pattern piece to the fabric for the sides of the tablet and traced the shape. 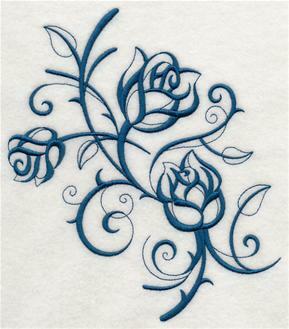 As I did for the back fabric piece, I created a paper template of the design I'm embroidering onto the sides of my stand and placed it on the fabric, leaving at least 1" between the fabric edges and the designs edges (so I don't stitch over the design later). I marked the side fabric pieces the same way I marked the back piece (center point, and horizontal and vertical axis points) and drew lines connecting the marks. 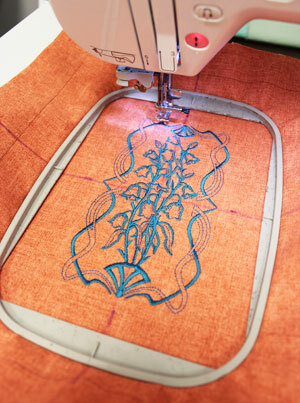 Then I hooped my fabric with medium weight cutaway stabilizer and embroidered the designs. After the designs finished, I trimmed the excess stabilizer and cut out the shape, and repeated these steps for the second side piece. 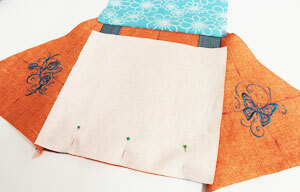 For the front of the stand, I cut a piece of print cotton fabric to 10" wide by 11 1/2" high. For the bottom I cut a piece of fabric to 10" wide by 9 1/2" high. With the pieces cut and ready, I could put them all together. I started by putting the side pieces onto the assembled back piece. With the back piece flat and facing right side up, I aligned the inner side edges of the side pieces (also right side facing up) with the sides of the back piece. The ends of the side pieces extended past the corners of the back piece on the top and the bottom about 1/2". Next I flipped the side pieces over on top of the back piece, with the side edges still aligned and right sides together. 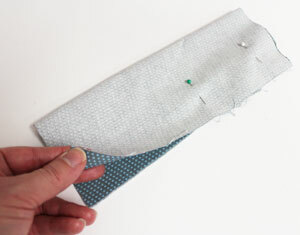 After pinning in place, I sewed a 1/2" seam along the side edges only, then pressed the seam with an iron. 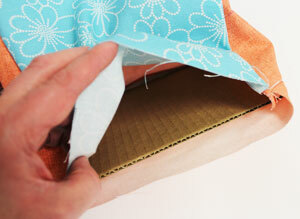 Note: I pressed each seam in the steps below after stitching, to make them lie flat for a nice crisp look. I put the front and back pieces together by aligning their top edges with right sides together. 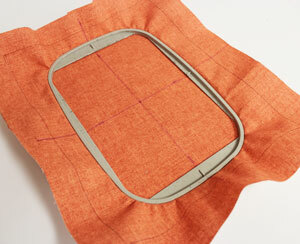 I allowed 1/2" of the top corners of the front piece to extend out past the seam at the top corners of the back piece. 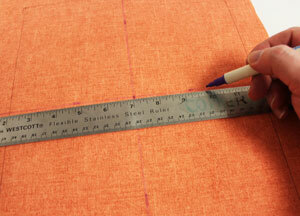 I pinned in place and sewed a 1/2" seam along the bottom edge only, starting and stopping 1/2" from each corner. 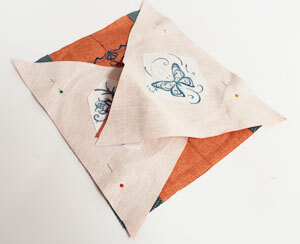 To add the bottom piece, I lined up one of its short ends with the bottom of the back piece, right sides together. 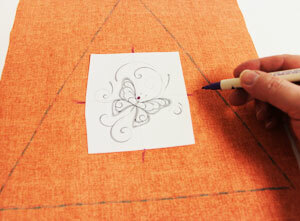 I allowed 1/2" of each corner to extend past the seam at the bottom corners of the back piece. 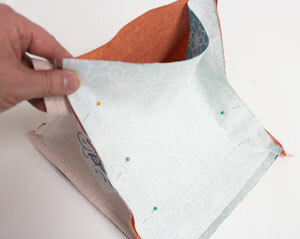 I pinned in place and stitched a 1/2" seam along the bottom edge only, starting and stopping 1/2" from each corner. Then with the side edges of the bottom piece aligned with the bottoms of the side pieces, right sides together, I pinned in place and sewed a 1/2" seam along the pinned edges only, starting at the existing seam and stopping at the raw edge. To stitch the front and side pieces together, I lined up the side edges of the front piece with the open edges of the side pieces, right sides together, pinned in place, and sewed a 1/2" seam along the pinned edges only (leaving the bottom edges open for turning), starting at the existing seam and stopping 1/2" from the raw edge. Then I turned the fabric right side out, and finished stitching the opening by turning it 1/2" in to the wrong side and finishing the seam along the drawn line. 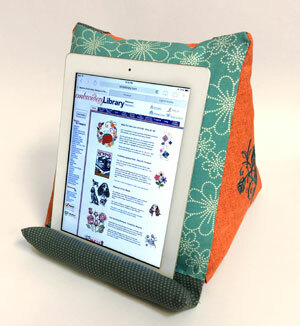 The completed stand has a ledge to hold a tablet or e-reader securely, and keep it from slipping off the stand. For this I cut a piece of fabric to 10 1/4" wide by 8" high. I folded the fabric lengthwise, right sides together, pinned in place, and sewed a 1/2" seam along the short edges only, leaving the raw edges open. After measuring and marking 2" down along each short end, I started at the folded corners and drew a line connecting the marks. 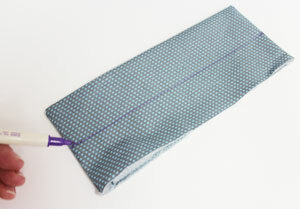 Then I sewed a seam along the line, leaving about 1 1/2" open along one end. 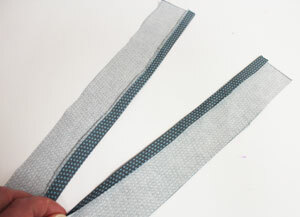 I stuffed the resulting "tube" with fiberfill at the open end until firm, and sewed the opening closed by continuing the seam along the drawn line. For added support at the base, I put a piece of corrugated cardboard cut to 8 1/2" wide by 7 3/4" high inside, lining it up with the bottom fabric piece. Adding a bag of beans or some other weight makes the tablet even more stable during use. I used a bag of beans as a weight by adding glue to the top of the cardboard, then slipping the bag of beans inside (the glue will keep the bag from moving around inside the stand). After adding the beans, I stuffed the stand with fiberfill until firm. Another way to weight the stand is to glue large metal washers onto the top of the cardboard. 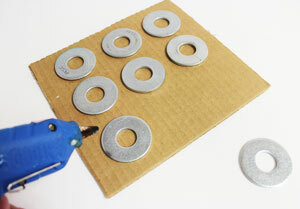 You can find washers at any hardware or home improvement store. To attach the ledge to the stand, I placed it inside the opening of the stand with about 1/2" extending inside, pinned in place, and with needle and thread, hand stitched it to the main portion of the stand. And that's the last step! Your tablet stand is ready to use. A homemade tablet stand is as charming as it is useful. Hold your electronic devices securely and with fabulous style. 6.90" x 7.65" | 5.85" x 6.49" | 4.83" x 5.36" | 3.48" x 3.87"
6.90" x 7.61" | 5.85" x 6.45" | 4.86" x 5.36" | 3.49" x 3.86"
5.99" x 11.75" | 4.80" x 9.41" | 3.98" x 7.80" | 3.52" x 6.89"